For a change, its an imported fish. Indeed. One of the favourites for us is definitely salmon. Honestly, we just so love salmon, but considering how much I have to pay, I try to limit and as I have already told you before, I try to stay true to our local catch (Ikan Masak Kicap, Bengali Fish Croquettes, & Mauritian Fish Curry) even if the fish dish is from another any part of the globe). Of course, every now and then, I somehow wobble and give in to salmon. The healthy, no smell and easy to cook fish. In fact, just some salt and pepper will do (Grilled Salmon), but of course, we shouldn't limit salmon to just one standard style of cooking which shouldn't be the fish case for other types of fish wherever they are swimming (Fish Sandwich, Spicy Grilled Fish, Batter Fried Fish, & Thai Crispy Fish). Alright. 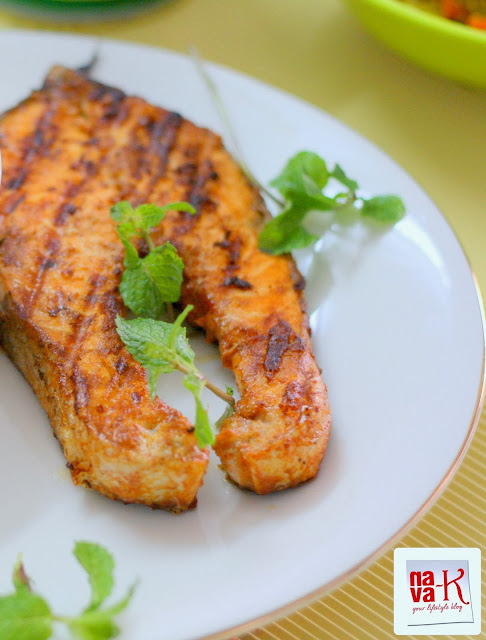 Let's get down to making Tandoori Salmon. You can, if you want to, use store bought Tandoori spice or for simplify, just follow this recipe of mine (Lemon Butter Salmon) Curry powder, ginger paste, garlic paste and spices (Indian-Spiced Salmon) marinated salmon, grilled in a non-stick over the stove grilling pan and for an appealing, vibrant (Teppanyaki Salmon) char on the outside and soft melting moment inside, paired alongside raw, refreshing, tangy mint yogurt chutney. Gently season salmon with all the ingredients except oil. Thereafter, heat oil and put salmon in. Grill on both sides for a nice char on outside layer and soft meat inside. love your colorful plats always, your clicks are always awesome and I eat your food with my eyes always. Thanks for sharing another interesting variations of salmon, loved the baked salmon recipe you posted sometime ago. 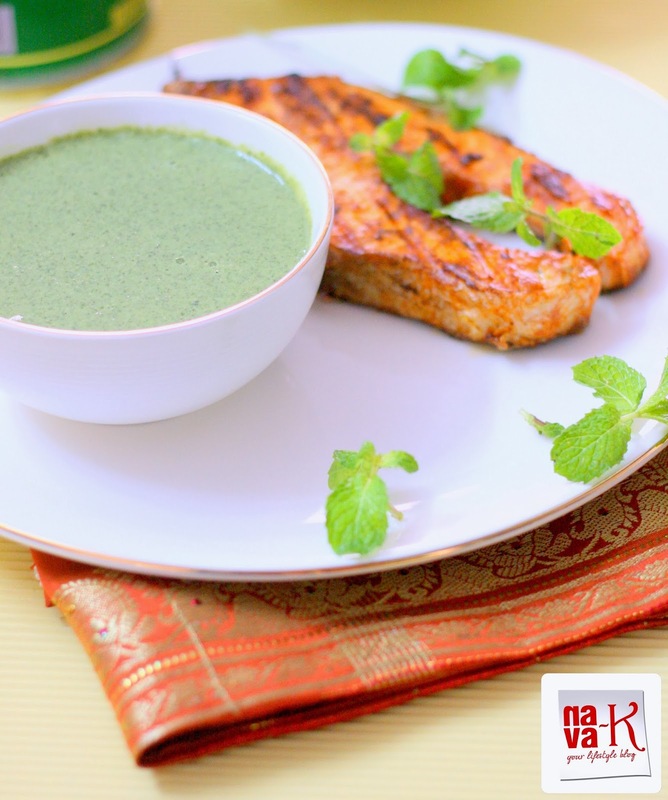 We are fond of salmon but could never get something which looks interesting, so for a long I have been doing a lot of trial and error and very few recipes click with my family... Will try this as well soon! Wow Nava this looks delicious. In fact I was thinking of making salmon tomorrow but was not sure the dip/chutney. oh you grilled it. Love the texture when it is grilled. In addition, it seals the moisture, juices and flavours in! Lovely plating as usual, Nava. This is an interesting combination of pan seared salmon with a side of mint chutney. I imagine it was pretty flavorful. Lovely colorful clicks .Simply splendid. very nice colorful plating.....wow......beautiful clicks..!!! The salmon looks good. Nice blog. What a beautiful presentation salmon plated with salmon colored napkin.I can imagine how tasty it would have been with mint chutney. We eat a lot of salmon and I like how versatile it is. All your recipes sound great and full of flavour. Beautiful colours too and the chutney is the perfect accompaniment. 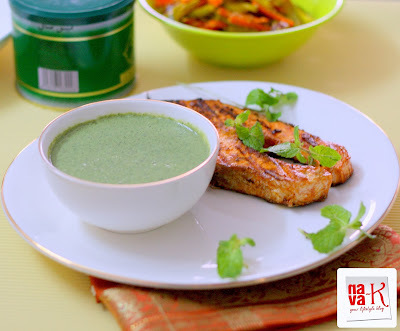 Very nicely seared, Nava! Like the different variations you've displayed here. Salmon is a fav of ours. It's so flavourful! Love the perfect grill marks on the slice Nava. Must have been so good with that mint chutney. Looks like a wonderful combination. 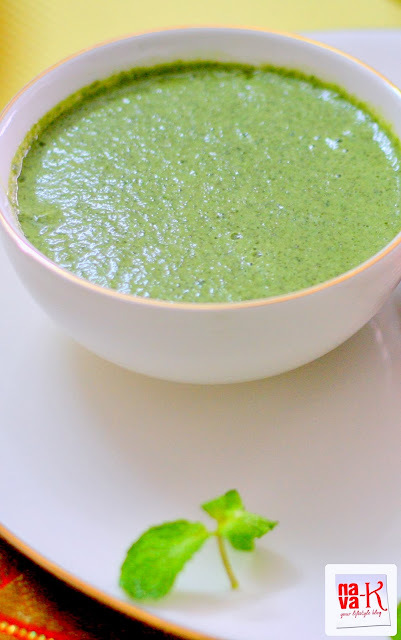 Love the chutney too and your pictures are delightful! This looks delicious. My son loves, loves salmon so I will have to check out all the salmon recipes!